Mailbag with Jennifer Pharr Davis: Should You Thru-Hike With Your Significant Other? Welcome to our sixth Mailbag with Jennifer Pharr Davis. 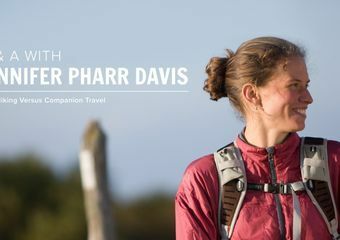 In case you missed it, we’re taking hikers’ questions and passing them off to the trail legend for her wisdom and analysis. JPD has solo thru-hiked the AT and PCT, set the self-supported FKT on the Long Trail, and the supported FKT on the Appalachian Trail. Her AT FKT landed her the honor as one of National Geographic’s Adventurers of the Year. But the real reason we love JPD and ask for her input? For such an accomplished hiker, she is down-to-earth and incredibly humble. She has figured out how to have a life off-trail as a wife, mother, and professional… and continue hiking. She has kept it classy amid the negativity and tense confrontations that can be part of the hiker trash community, and she has always found ways to give back to the trail and conservation organizations. JPD’s newest book, The Pursuit of Endurance is now available to purchase. Read our review here, and check out this inspirational book for yourself. Let us know if you read it—we’d love to hear what you think. Have a question for an upcoming Mailbag? Email [email protected] and we’ll pass it on. Should I start a thru-hike with someone if we are in a relationship, or if I have feelings for that person but am unsure of our future together? Nope, no one sent this question into the Mailbag. But I’m answering it because I don’t feel like writing about the “right” pack capacity and this is a concern that has come up for me in the past as well a number of my friends. Trust me, the wrong boyfriend can end a hike a lot faster than having too much or too little volume with your backpack. So should you hike with a significant other if you are on shaky ground? The first question to ask yourself is if you both really want to hike the trail? If your plus-one is going out there mainly for you, rather than the experience of hiking a long trail, then it will likely lead to problems. There are easier ways to spend quality time together than putting on a pack and walking 2,000 miles. If you want your relationship to work out, then it might not be worth putting it through the stress of thru-hiking. Although a thru-hike might be your dream it can quickly become your partner’s nightmare. You might feel like you need or want the stress of a thru-hike to help determine whether or not the relationship is meant to last. But I assure you that hiking a long distance trail apart from your loved one will also test the relationship. Ultimately, what you are looking for is someone who will support your dreams. That can mean hiking beside you but it can also take the form of sending packages and heart emojis from home. The best couples don’t always make the best hiking partners. If you do decide to take on the trail with a romantic partner, talk through the expectations before you start. What are your different hiking styles? Does one person hike fast and the other slow? Is the plan to walk together or connect at different points throughout the day? How much money will you spend on your thru-hike? How much time are you going to spend in town? Can other people join your group? I could keep going ad nauseam with this list, but maybe the most important question to ask is… What happens if one person quits? If one person gets off the trail does that mean the end of the hike for both people? Resentment can build up pretty quickly if a hike ends because of someone else’s decision or if the trail feels more important than a relationship. Discussing the options before you set out will help make the transition easier if and when you need to make a decision to get off together or set out alone. I’m a little split on this one. On one hand, I love the idea of lightening the load and parceling out the gear on a thru-hike. But, even if you manage to complete the trail in a state of relationship bliss, I fear that gear sharing can leave one person unprepared if you accidentally get separated or choose to part ways. If you do decide to share gear, then make sure each person has what he or she needs in a pinch including makeshift shelter, food, warmth, and first aid. It’s a frustrating and dangerous predicament to be caught in an electrical storm when your tent is three miles down the trail. You might also consider carrying gear that gives options for creating space and fosters a feeling self-sufficient. You can be completely in love and still carry two one-person tents. It will provide more flexibility for hiking different paces during the day, splitting up for a night or two, and continuing down the trail if one person is forced to stop. The depth of love for my husband knows no bounds and yet one of the biggest gear gaffes we made is buying sleeping bags that zip-together and assuming that we would use them that way. Think about how confining a sleeping bag can be and how disgustingly sticky your body can be during a thru-hike. Now imagine putting another dirty, smelly, body in the bag with you. It’s not nearly as romantic as it seemed in the hardgoods department of the outdoor store. What happens if you break up and both want to keep hiking? Existing in the same thin, long community can be difficult once you part ways. Make sure you keep it classy. Making negative comments about your former partner will impact his or her experience and friendships on the trail. No matter how much drama there was and regardless of who’s fault it is that you broke up, it’s never appropriate to spend your energy slandering another hiker. Trail gossip is interesting and relationship stories help pass the miles on a long day but most of us have enough high-school sagas to last us from Georgia and Maine. Make sure your overshares are not adversely affecting someone else’s hike. I remember being in a group where one hiker asked another guy about the woman who he was in a relationship with at the start of the trail. He said, “It didn’t work out between us, but she’s still hiking so I don’t want really want to talk about her or our relationship.” In that moment, I gained so much respect for that guy! So what if your relationship survives the trail and now you are more in love than ever? You do not have to get engaged on the last mountain! (but if you do, that’s awesome and I hope that I’m there or that I get to see the picture on Instagram because I think it’s super adorable.) Remember, a relationship on the trail is different than the day in and day out of everyday life. It’s easy to ignore things like incompatible life goals, demanding careers, and difficult family members when you are isolated on the trail and unified by the common objective of reaching the end. If you had problems off trail before leaving for your hike, they are still going to be there when you get home. You are probably not going to spend most of your long-term relationship on long-distance trails. It’s more important to work together and stay committed off trail than it is when you are hiking. On the other hand, some of the tools that you gained on your journey can help your relationship at home. Communication is key—discuss your expectations. Find ways to share your lives and homes together and also give each other some space. Try to support one another’s dreams even when they are not the same. And when you go through tough times, think back to all the hardships, climbs, and storms that you made it through together on the trail. The same teamwork, communication, and positivity that allowed you to finish the trail can help you stay in a loving, committed relationship at home. Want to chat with JPD about this subject? She’ll be hosting a live session on the Trek AT Facebook Page on Friday, April 27th at 12:00pm EST.